Coming off a statement win over No. 4 Virginia in hostile territory, the No. 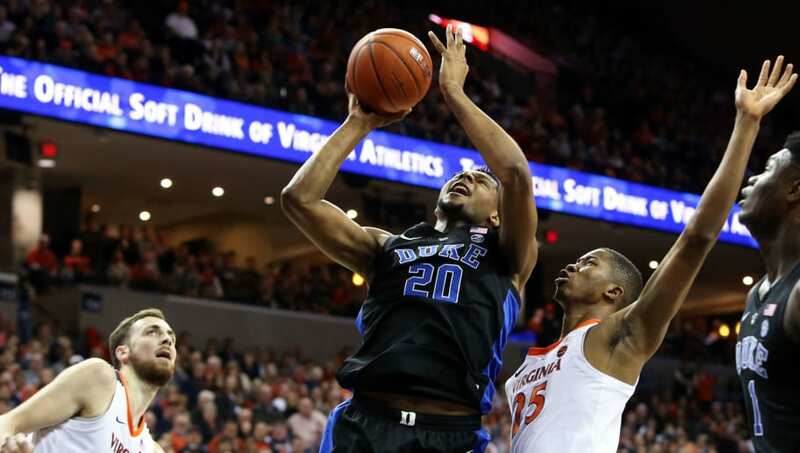 2 Duke Blue Devils have made a very strong case for top-ranked status. Surprisingly, however, the AP voters still aren't convinced. The AP media panel kept the Tennessee Volunteers in the top spot of the newest AP Top-25 poll, with Duke sitting 19 points behind them. Meanwhile, Duke is the top-ranked team in the NCAA Tournament rankings. The AP may still be on the fence for now, but luckily for the Blue Devils, the folks at FanDuel Sportsbook are giving them the recognition they rightfully deserve. Duke (+180) is still the odds-on favorite to win the NCAA Tournament come March, according to the latest tournament odds. Tennessee (+1200), on the other hand, finds itself tied with No. 6 Michigan (+1200) for fourth-best odds to win it all. There's still plenty of time for Duke to leapfrog the Volunteers in the rankings and, with three remaining ranked opponents to play (No. 22 Virginia Tech and No. 8 North Carolina twice), it has a strong enough remaining schedule to make it happen. However, it may need Tennessee to stumble a bit to close out the season.